According to a recent survey by the American Academy of Cosmetic Dentistry (AACD), 99.7% of Americans believe a smile is an important social asset and 74% feel that an unattractive smile could harm a person’s chances for career success. With such an aesthetic emphasis being placed on one’s smile, New Jersey cosmetic dentist Dr. Harold Pollack says he has seen a significant increase in patients interested in a smile makeover in the past few years at his practice. He says the growth in demand for procedures such as porcelain veneers in New Jersey means patients must take extra care in finding a cosmetic dentist who has extensive experience and qualifications. The recent media spotlight from reality makeover shows and direct-to-consumer marketing of teeth whitening has brought an increase in attention to comprehensive cosmetic dental procedures. Smile makeovers, combining teeth whitening, porcelain veneers or other dental enhancements, have become a popular dental option for patients looking to improve their appearance. The American Academy of Cosmetic Dentistry (AACD) reports in a recent study that the number of teeth whitening procedures performed have increased by 300% in the past five years, and porcelain veneers have increased by 250% since 2006. At his practice for cosmetic dentistry in New Jersey, Dr. Harold Pollack says he has seen similar results regarding the growth in popularity of cosmetic dental enhancements. According to another recent survey by the AACD, 99.7% of Americans believe a smile is an important social asset. 74% of Americans also feel an unattractive smile could potentially hurt employment success. Because the media has drawn recent attention to makeover reality shows, Dr. Pollack says the increase in cosmetic dental procedures comes as no surprise to him. He adds that in order to ensure the best results for a procedure such as teeth whitening in New Jersey, patients need to select a dentist with the proper credentials and experience. Whether patients are seeking porcelain veneers or a combination of cosmetic dental enhancements, Dr. Pollack suggests finding a dentist focused on personalized care when it comes to smile makeovers. He says a dedicated staff combined with an experienced and specialized cosmetic dentist can offer patients confidence in their smile. About Harold A. Pollack, D.D.S. Dr. Harold Pollack received his Doctor of Dental Surgery degree from the Temple University School of Dentistry. He is a Fellow of the Academy of General Dentistry and a member of the American Academy of Cosmetic Dentistry, the American Dental Association, and the New Jersey Dental Association. He has been selected as “Best Dentist in America” and NJ Monthly Top Dentist 2010. Located at 280 Millburn Avenue in Millburn, NJ, Beautiful Smiles by Dr. Pollack can be reached at (973) 947-4331. 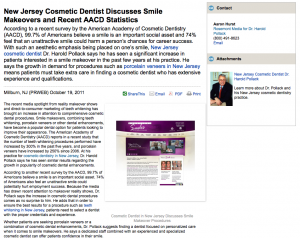 Dr. Pollack’s practice can also be contacted via the website beautifulsmilesnj.com or facebook.com/drharoldpollack.